I had posted yesterday about a great deal at Snapfish where you get a $10 credit just for signing up which you can use to purchase any number of great photo gifts for next to nothing. That deal is still working so you can go grab your free $10 and get a custom address book like I did for only $1.59 shipped or a 30 page flip book for only $1.99 shipped. 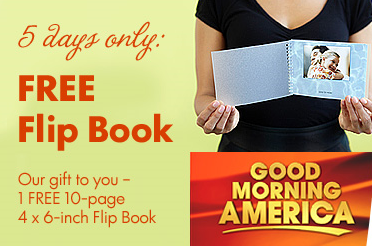 Now, on top of that you can also get a FREE 10 page Flip Book as seen on Good Morning America. Go here, in the center of the page you will see “As Seen On Good Morning America” very small in the center of the page, click there and make your book. The price of the book will come off at the very end (after you put in your credit card info). Note, if you already signed up you will have to log out to see the link. You will be logging back in under your account that you already set up. I wasn’t able to see the Good Morning America while I was logged in. So for $1.99 (shipping cost) you get yet another great gift for next to nothing.